^ US Chapter. Reports Without Borders. [2019-03-14]. ^ Ireland tops press freedom index. The Irish Times. 10 October 2009. ^ Reporters Without Borders keeps UNESCO consultative status, condemns disinformation, Reporters Without Borders, 13 March 2012. ^ Contact us. Reports Without Borders. [31 July 2012]. （原始内容存档于2012-08-04）. ^ Charlotte Menegaux. Robert Ménard 'se passera très bien des médias'. Le Figaro. AFP. 26 September 2008 [24 December 2008]. （原始内容存档于2008-12-24） （法语）. 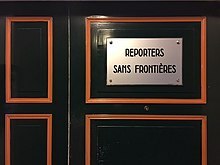 English translation: "Robert Ménard 'will be fine media' "
^ Reporters Without Borders provides funding for journalists and media in danger. Reports Without Borders. 13 July 2009 [3 March 2012]. ^ RSF and its partners unveil the Journalism Trust Initiative to combat Disinformation. Reports Without Borders, 3 April 2018. [2018-07-05]. ^ Reporters Without Borders Picks Taiwan for Asian Bureau. New York Times. [7 April 2017]. ^ Reporters Without Borders opens first Asia office in Taiwan. 法新社. [7 April 2017]. ^ Handbook for bloggers and cyber-dissidents (PDF). Reporters Without Borders. March 2008 [3 March 2012]. （原始内容 (PDF)存档于2012-02-27）. ^ List of the 13 Internet enemies 页面存档备份，存于互联网档案馆 Reporters Without Borders (Paris), 11 July 2006. ^ "Internet enemies" 页面存档备份，存于互联网档案馆, Reporters Without Borders (Paris), 12 March 2009. ^ Web 2.0 versus Control 2.0. 页面存档备份，存于互联网档案馆 Reporters Without Borders (Paris), 18 March 2010. ^ First Online Free Expression Day launched on Reporters Without Borders website. Reports Without Borders. 12 March 2008 [31 July 2012]. （原始内容存档于2012-06-16）. ^ Network, Diana Barahona,Jeb Sprague,Voltaire. Reporters Without Borders and Washington's Coups, by Diana Barahona, Jeb Sprague. Voltaire Network. [2019-03-14] （英语）. ^ 林深靖. 普世價值或淺薄的舒適？「無國界記者」與台灣. 苦勞網. 2017-05-15 [2017-05-27] （中文（台灣）‎）.